Outdoorsmen know that picking the best knife for a job requires thought and attention to the task at hand. Though certain jobs require a very specific blade with carefully selected attributes, much of the time a blade should be as multifunctional as possible, incorporating as many ergonomic and practical features as possible while sacrificing a minimum to the specificity of design that would pigeonhole it to a particular task. Similarly, there are a handful of smiths whose longevity and repute are the marks of their character and quality. One of these is Cold Steel, which has for nearly half a century been supplying outdoorsmen and tacticians alike with the knives to meet their needs. It can seem an insurmountable task to select ‘the’ best Cold Steel knife, but for a given job or class, Cold Steel is sure to please. Cold Steel is the storied manufacturer of a full line of knives, ranging from thumbstudded tactical folders with an eye on concealment to push daggers to subhilt-sporting fighting knives. Whether your passion is martial arts, hunting, camping, hiking, fishing, or even whittling, the best Cold Steel knife is waiting for you to discover and put to trial. 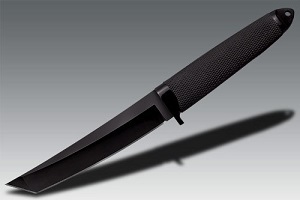 For those interested in martial arts or defense, there are options such as Cold Steel’s OSI fixed blade with a black Kraton hilt and an integral subhilt for unrivaled blade control and quick retraction. Supporting its 8 ¼ inch AUS 8A blade, this knife is an excellent training tool. If campcraft is more attuned to your interests, something like their Bowie Bushman is sure to please. Combining an SK-5 blade with a thick spine and a hollow handle with a sheath bearing a ferrocerium rod, this knife has practically limited out on the number of utile features that a blade can possibly incorporate. Not only is it a camp knife, but it can also be used to strike a fire or outfit onto a pole as a spear for use as a hunting implement. For a no-frills all business hunting knife or for everyday carry, you might choose SRK fixed knife that is as much at home carving fuzz sticks as it would be cleaning a rabbit; or in a pinch, taking the filets off of perch. With an SK-5 blade and an extremely durable Kray-ex handle, this blade is nearly impossible to best for ruggedness. Topping off the package is Cold Steel’s guarantee. Cold Steel warranties its knives against defects in workmanship, so the very second your knife is delivered, you can rest easy that it is ready to get to work. When you’re looking for the best Cold Steel knife, your vendor is White Mountain Knives. White Mountain Knives has the best selection of blades around for an impassable number of uses from everyday carry to campcraft. White Mountain Knives ships free in the USA and maintains excellent vendor relationships, so on the off chance you’re looking for something hard to find, reach out to White Mountain to have it sourced. Check out their dazzling display of inventory today at WhiteMountainKnives.com.